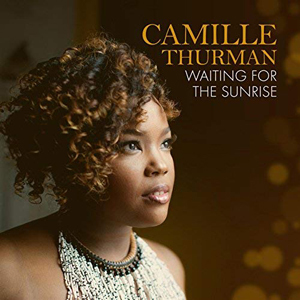 Camille Thurman was one of three bright young musicians who streaked across the Jazz firmament in 2014 with debut albums as leaders that listeners took to heart immediately (the others were drummer Shirazette Tinin and bassist Mimi Jones); the musicians had also formed the appropriately entitled label Hot Tone Music to announce that they had arrived. Miss Thurman (like the others) went on to send an urgent message, which in her case was that she was a tenor saxophonist to watch out for. Three albums later she appears to have added a new dimension to her artistry – that of a vocalist. 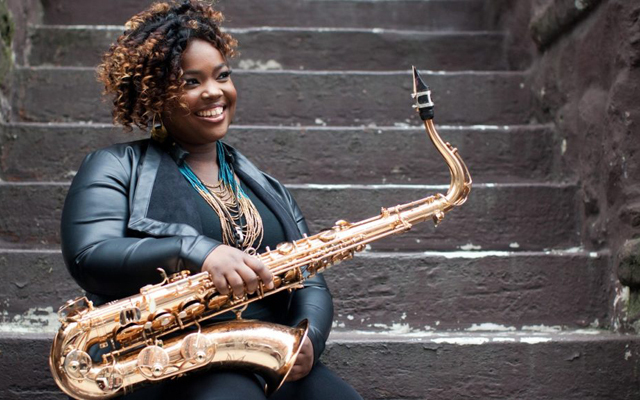 She has tested the waters several performances ago including a memorable one together with Charenee Wade in homage to Sarah Vaughan (Jazz at Lincoln Center, 2017) and later as part of the vocal contingent of the Jazz at Lincoln Center Orchestra’s memorable world premiere of Wynton Marsalis Ever the Fonky Lowdown (Jazz at Lincoln Center, 2018). This album Waiting for the Sunrise was recorded somewhere in between. It certainly “plays” like it was a long time coming because what Miss Thurman brings to this studio performance is a magnificent vocal instrument that immediately suggests that she was born to sing. Much of the repertoire comprises standards and show-tunes which Miss Thurman infuses with the Blues, which certainly appears to be part of her DNA. The manner in which she squeezes an elemental pain into the lyric of “If You Love Me (Really Love Me)” is evidence enough of her credentials as a Blues-woman of considerable potential. One Sheldon Brooks’ “Some of These Days”, her elongation of syllables, deep diving into the lower register as she taunts her departing lover suggests intimations of something that Bessie Smith might do. Of course all of this is done in Miss Thurman’s own inimitable way. And it’s not simply in these songs that she wears her Blues on her sleeve as a badge of courage. Of course, Miss Thurman is much more than a Blues singer; her Jazz chops suggest she is bound for a realm peopled by great pantheon of Jazz vocalists – men and women alike. Miss Thurman also wields a BIG tone on the tenor saxophone, but she is tender as the petal of a rose even as she caresses the sinews of the phrases she makes, soloing in between vocal choruses. There is here, more than a passing resemblance to the tough tenderness of big Ben Webster in the prime of his existence. As ever the test of Miss Thurman’s artistry comes in the manner in which she can handle a ballad, which she does on Milton Nascimento’s ethereally beautiful “Tarde” – Jeremy Pelt is magnificent in his muted solo as well – but Miss Thurman’s masterful handling of Hoagy Carmichael and Ned Washington’s “The Nearness of You” is utterly breathtaking; easily the crowning glory of the album. It bears mention that Miss Thurman’s rhythm section – the great bassist Cecil McBee and drum legend Steve Williams, who played with Shirley Horn for two and a half decades together with guitarist Jack Wilkins, who plays perfect foil to Miss Thurman on “After You’ve Gone” with his sly comping – are masterfully cast in slightly more than supporting roles on the album. And Nicholas Prout’s Binaural Technology recording on yet another magnificent Chesky production make this a Jazz album to die for.